The global osteoarthritis drugs market is expected to reach a market value of about US$ 11,226.1 Mn by the end of 2026, expanding at a high single digit CAGR during the forecast period. Rise in R&D expenditure, increased prevalence of osteoarthritis across the globe, increased geriatric population, rise in awareness regarding degenerative bone diseases in developing countries, and rich pipeline of innovative treatment options are some factors that are expected to boost the global osteoarthritis drugs market during the forecast period. Moreover, increasing research and development activities in disease modifying drugs and surge in investment by key players in the clinical studies of advanced treatment options are expected to propel the global osteoarthritis drugs market during the forecast period. However, the high cost of advanced treatments and severe side-effects associated with certain injectable treatments are expected to hamper the osteoarthritis drugs market. The global osteoarthritis drugs market has been segmented based on drug class, route of administration, and distribution channel. In terms of drug class, the global market has been classified into corticosteroids, NSAIDs & others, and viscosupplementation agents. The viscosupplementation agents segment dominates the global osteoarthritis drugs market, in terms of value, owing to its high cost. This segment is also expected to expand at a significant CAGR owing to its effectiveness in the treatment of knee osteoarthritis, increasing acceptance of viscosupplementation for the treatment of chronic pain associated with osteoarthritis, and long duration of pain relief provided by the treatment. Based on route of administration, the global osteoarthritis drugs market has been divided into oral, parenteral, and topical. The parenteral segment held a major share of the market in 2017. It is expected to maintain its leading position, in terms of market share, during the forecast period. In terms of distribution channel, the global osteoarthritis drugs market has been segregated into hospital pharmacies, retail pharmacies, and online pharmacies. The hospital pharmacies segment held a major share of the market in 2017, followed by retail pharmacies. The hospital pharmacies segment is expected to maintain its market share during forecast period due to acceptance of advanced treatment options requiring hospitalization. The online pharmacies segment is projected to expand at a considerable CAGR during the forecast period, owing to easy availability of over-the-counter drugs at home at a discounted price. In terms of geography, the global osteoarthritis drugs market has been segmented into North America, Europe, Asia Pacific, Latin America, and Middle East & Africa. 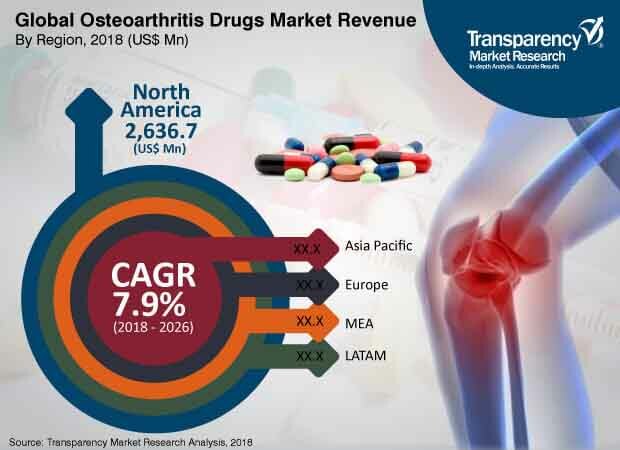 North America dominates the global osteoarthritis drugs market owing to high acceptance of viscosupplementation agents in the U.S. and presence of major players in the region. According to the Centers for Disease Control and Prevention, one in every five adults in the U.S. has doctor-diagnosed arthritis. As the country's population ages, it is estimated that this number would increase to at least 67% by 2030. Rising incidence of osteoarthritis leading to disability, demanding advanced therapies and disease modifying drugs, is a major factor driving the market in North America. The market in Asia Pacific is projected to expand at a significantly high CAGR during the forecast period, owing to improving health care infrastructure, rising investments in research and development in countries such as China and India, and high acceptance of viscosupplementation agents in Japan. Furthermore, Japan is the second-largest market for viscosupplementation products after the U.S., which in turn is anticipated to further boost the market in Asia Pacific in the near future. Major players operating in the global osteoarthritis drugs market include Horizon Pharma plc., Pfizer Inc., Sanofi, Anika Therapeutics, Inc., Ferring B.V., Bioventus, Inc., Chugai Pharmaceutical Co., Limited, Alkem Laboratories, Flexion Therapeutics, Inc., and Zimmer Biomet Holdings, Inc. Key players are expanding their product portfolios through mergers & acquisitions and partnerships & collaborations with leading pharmaceutical and biotechnology companies and by offering technologically advanced products. The global osteoarthritis drugs market report comprises an elaborate executive summary, including a snapshot that provides information on various segments of the market. It also provides information and data analysis of the global market with respect to segments based on drug class, route of administration, distribution channel, and region. A detailed qualitative analysis of drivers, restraints, and opportunities of the market has been provided in the market overview section. Additionally, the section comprises competitive matrix and profiles of key market players, along with business overview, to project the competitive landscape of the market. The section also provides market attractiveness analysis based on region and market share analysis in terms of key players, thereby presenting a thorough analysis of the overall competitive scenario in the global osteoarthritis drugs market. Based on drug class, the global osteoarthritis drugs market has been segmented into corticosteroids, NSAIDs & others, and viscosupplementation agents. The segments have been analyzed based on available drugs used during the treatment of osteoarthritis, and cost-effectiveness. In terms of route of administration, the global osteoarthritis drugs market has been classified into oral, parenteral, and topical. Based on distribution channel, the global osteoarthritis drugs market has been divided into hospital pharmacies, retail pharmacies, and online pharmacies. Market size and forecast for each of these segments have been provided for the period 2018 to 2026, along with their respective CAGR for the forecast period 2016 to 2026, considering 2017 as the base year. In terms of region, the global osteoarthritis drugs market has been segmented into five major regions: North America (the U.S. and Canada), Europe (the U.K., Germany, France, Spain, Italy, and Rest of Europe), Asia Pacific (India, China, Japan, Australia & New Zealand, and Rest of Asia Pacific), Latin America (Brazil, Mexico, and Rest of Latin America), and Middle East & Africa (South Africa, GCC Countries, and Rest of Middle East & Africa). Market size and forecast for each of these regions and the mentioned countries have been provided for the period 2018 to 2026, along with their respective CAGR for the forecast period 2016 to 2026, considering 2017 as the base year. The research study also covers the competitive scenario in these regions. The report also profiles major players operating in the global osteoarthritis drugs market based on various attributes, such as, company overview, financial overview, product portfolio, business strategies, and recent developments. The players covered in the report include Horizon Pharma plc, Pfizer Inc., Sanofi, Anika Therapeutics Inc., Ferring B.V., Bioventus Inc, Chugai Pharmaceutical Co. Limited, Alkem Laboratories, Flexion Therapeutics Inc., and Zimmer Biomet Holdings Inc.